Cool: Radio 4 gets offered to play a Motorola-sponsored festival in São Paulo, Brazil. It will make the group money. Cruel: Almost everything in the music business that makes a band money these days involves either sponsorship or licensing. Cruel: The first night’s “hotel accomodation” appears to be the overnight flight down from New York. Cool: The line-up for the Motomix Festival is a dream mix of indie and electronic rock across two stages, starring Franz Ferdinand, Art Brut, Radio 4, Annie, Schneider TM, Andrew Weatherall, Adult, Swayzak, Adam Freeland, Isolee, and New Order’s Peter Hook. Cool: The promoters assure us it will only take two trips to the Brazilian consulate to acquire our work visas. Let us be in no doubt as to the star attraction of the Motomix Festival. Cruel: I know that it’s smog-ridden, traffic-choked and home to almost 20,000,000 people. Cool: Four days before departure, the forecast calls for a weekend of solid sun and high temperatures. Cruel: The day before departure, the forecast shows that solid sun and high temperature on our day of arrival will drop to heavy rain and winter cold for the weekend. Cool: I hire an English Tour Manager experienced in complicated concerts. Cool: The flight is almost empty: we should each get a row to ourselves. Cruel: The flight is delayed twice, and the gate changed twice. Cool: The band member with a phobia for flying (because there has to be one) pops his sleeping pills and prepares to conk out. Cruel: The flight is suddenly canceled. Cruel: All flights from NYC to Brazil are overnight flights, and this is Delta’s only flight. We might be stuck in limbo for another 24 hours. Cool: By the wonders of cell phones, we get hold of the promoters (in São Paulo), our travel agent (in NYC) and the band’s booking agent (in Rio with Franz Ferdinand), all on their cell phones. Cruel: It’s 11pm at night. None of them can do anything for us right now. Cool: After an hour back on line at the Delta check-in desk, we are promised that the airline will work all night fixing the “mechanical failure,” that our flight has been rescheduled for 8:30 in the morning. And that Delta will put us up in hotels in the interim. Cruel: One band member blurts out “We don’t need hotels. We all live in Brooklyn.” Speak for yourself. Cool: Those of us who want them are given hotel and meal vouchers for the Airport Holiday Inn. The others are given cab vouchers back to their Brooklyn abodes. Cruel: We’re told to check in again at 6:30am. It’s now 11:30pm. Cruel: E-mailing the Brazilian record company and telling them to cancel the scheduled interviews on Friday. 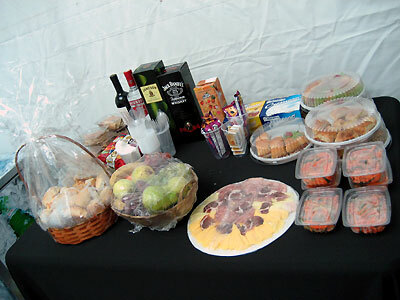 A typical backstage rider. Before it’s sampled. Note the lack of M&Ms, especially brown ones. Cool: Getting my head down at 1am. Cruel: Not sleeping properly for fear of alarm not going off. Alarm goes off at 5:30 am loud enough to wake the dead. Cool: I can get by on three hours sleep. Cruel: But only if I go to bed at dawn. NOT if I get up at dawn. Cool: At airport at 6:30 am as requested. Cruel: Flight has already been put back an hour. “Crew rest” is the cited explanation. What about passenger rest? Cool: Delta admits why the flight was canceled. Cool: The flight finally takes off. Cool: I have a middle row to myself and a nine-hour flight ahead of me. I lie down with three pillows, eye shades and ear plugs. Cruel: It’s also the middle of the day. I can’t sleep. Cool: The airline, as an apology for our canceled flight, announces it will be comping the alcoholic drinks. Cruel: The Fish Eye Pinot Grigio from California, good though it is, does not put me to sleep. Cool: The Lindsay Lohan in-flight movie Just My Luck is partly about a British band that makes it in NYC. Cruel: That band is McFly. Cruel: After 30 hours in the same underwear. Cool: Hey, we’re not complaining. We’re in São Paulo. Cruel: Did I mention that it’s smog-ridden, traffic-choked and home to almost 20,000,000 people? 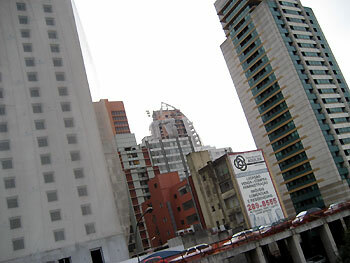 The view of São Paulo from the main thoroughfare, Av. Paulista. Concrete is a good business to get into in this city. Cool: It’s 11pm, we’re checked into our hotel, and Radio 4 join the Franz Ferdinand and Art Brut entourages in celebrating Franz Ferdinand drummer Paul Thomson’s birthday at the hotel bar. Cruel: The promoters inform managements that that the Mayor of Sao Paulo has put an injunction on the concert. Apparently, it’s election season and he wants to crack down on “all-night raves” to attract the conservative vote. Why does that sound so familiar? Cool: The promoters have gone to court (three courts!) to fight the injunction. They promise that in one venue or another they will put on a concert. Cruel: These promoters have been so thorough in every respect. That the festival might be moved or canceled seems as unfair on them as it does on the bands. Cool: As there’s nothing I can do about it, retire to the “English pub” –style “Piano Bar.” Make friends with Franz Ferdinand and Art Brut entourages. Cruel: “Old English pub” equals “smoking encouraged.” After one drink, I’m fully fumigated. The non-performers in the Radio 4 entourage head out for food. Cool: There’s a row of street-side café restaurants just round the corner from the hotel. Cruel: When we sit down at one, I remember that very few Brazilians speak even a word of English. Cool: I negotiate the words for “beer” (“Brahma”) and “sandwich – no meat” (“Sandwich – sin carne). Cruel: The sandwich is sent out with a thick slice of meat between the bread. Cool: The three of us return to the hotel determined to get a good night’s sleep. Cool: The bar is about to close. Given that the center of the hotel is a fifteen-story open lobby, which carries the sound of piano up the vast vestibule into every room, this means some of us can now sleep. Cruel: Those who have closed out the hotel bar have now decided to close out the city’s bars. The following day will see ‘Do Not Disturb’ signs on almost every room in the hotel. Cool: Finally getting a night’s sleep again. Cruel: Being woken by a ringing phone again. Cool: It’s Saturday morning, and there’s a production meeting in the promoters’ office at the hotel. This all feels very professional. Cruel: The promoters announce that they still don’t know where the concert will be held, over how many days, or on how many stages. This is all feels very ameteur. Cool: Watching Everton-Wigan live on the in-room TV while waiting for news about the concert. Cruel: Watching Andy Johnson score for a team other than Crystal Palace. Cool: It’s Saturday lunchtime, and the promoters have won their court battle. A judge has upheld that the Motomix Festival can take place at the intended venue, the Espaco Das Americas. Cruel: The same judge has also agreed with the Mayor that the outdoor tent and indoor stage together pose a security hazard. Instead of running across two stages in one night, the event will now run over one stage and two nights. 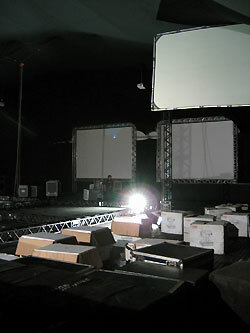 The dance tent as it starts to be dismantled, unused. Cool: If I get to the venue early enough on Saturday night, I’ll be able to see Annie, Art Brut and Franz Ferdinand, all of whose albums I love and none of whom I’ve seen before. Cruel: Because we’re flying home Sunday night, I’ll miss Schneider TM, Andrew Weatherall, Adult, Swayzak, Adam Freeland, Isolee, and New Order’s Peter Hook among others. Cool: There are a few dozen Franz Ferdinand fans waiting behind barricades outside the hotel. Cruel: It’s raining on them. The weather is miserable. Cool: It’s Franz Ferdinand’s last date on a three-year world tour that has taken them through two hit albums without a break. Cruel: They skip soundcheck to go recording in a famous São Paulo studio. Some groups don’t know how to stop working. Cool: And some groups know that if the dice start rolling your way, you’d better try take control of that luck and stack up your chips. That means working hard and taking nothing for granted. Good luck to them. Cool: The dance tent has been set up with the latest in lights and sound. Cruel: It’s busy being dismantled. What a shame. Cool: The Espaco Das Americas is vast. It holds 10,000, and 7800 tickets have already been sold. Cruel: The kids will need to come back on a second day to see all the music they paid for. Cool: After soundcheck, our interpretor offers to take us to the restaurant A Maneira. Cruel: The band all need sleep before the all-nighter ahead. They pass. Cool: A Maneira, representating the State of Minas Gerais, has an all-you-can-eat buffet. Cruel: There aren’t enough hours in the day to eat everything on display. Cool: There’s tons of vegetarian food, from grilled cheese sandwiches and grilled vegetables to mini cheese pizzas, mashed potatoes, pumpkin, hard cheeses, Brazilian potato and cheese breads, a full salad bar and even grilled pineapple. And more cheese. Cruel: There’s also enough dead animals to fill several abbatoirs. 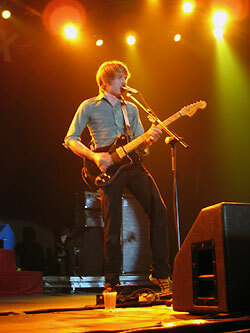 Franz Ferdinand’s Alex Kopranos in concert. Cool: The all-you-can-eat buffet includes all-you-can-drink tequila-like aperitifs and liquors of various tropical flavors. Cruel: We have to stay up all night working. They’re not on our menu. Cool: There’s Brazilian wine on the wine list. Cruel: Most of it is by the bottle. And I’m dubious of any generic ‘house wine’ by the glass. Cool: Through our interpretor, the waiter insists I can order any of the wines on the “bottle” list for the “glass” price. Cruel: It’s so good (in its imitation Californian manner) that I wish I could risk more than the one glass. Cool: Sure enough, I’m charged the same price for this most expensive wine on the list as I would have been for the cheapest. All of about $2 US. Cruel: That no bars I know of in the USA or UK have picked up this great idea: one price fits all. Cool: The waiters come by with pitchers of alcoholic fruit drinks. “Guava colada” anyone? Cruel: Did I mention we have to stay up all night working? Cool: There are approximately 20 desserts on the buffet table in front of me. Cruel: My stomach is starting to expand in front of me. Cool: The entire bill comes to less than $90 between the three of us. Including tip. Cruel: That’s Brazilian dollars. We’re talking a total of about $14 US per person! Cool: It’s 11pm on a Saturday night, I’m bloated and sated and ready for bed. Cruel: It’s time to go to work. I can’t wait to read Pt II. To me it sounds like a “nightmare”, all that travel in so little time. I’ll stick to living “vicariously”.